This guide takes you through the steps to setup a simple Custom Dashboard in Umbraco. Why provide a Custom Dashboard for your editors? There are a lot of parallels with Creating a Property Editor, the tutorial 'Creating a Property Editor Tutorial' is very much worth a read through too. At the end of this guide, we should have a friendly welcoming dashboard displaying a list of the editor's recent site updates. Next we will create a HTML file inside this folder called 'WelcomeDashboard.html' the html file will contain a fragment of a html document and so does not need <html><head><body> entities. So the terminology here gets a bit muddled but we're creating a 'Section' (but this is not the same 'Section' as the 'Content Section' - which inside this config file is referred to as an 'Area'), this is specifically a 'Dashboard Section' that you can use to group your dashboard tabs and controls together. 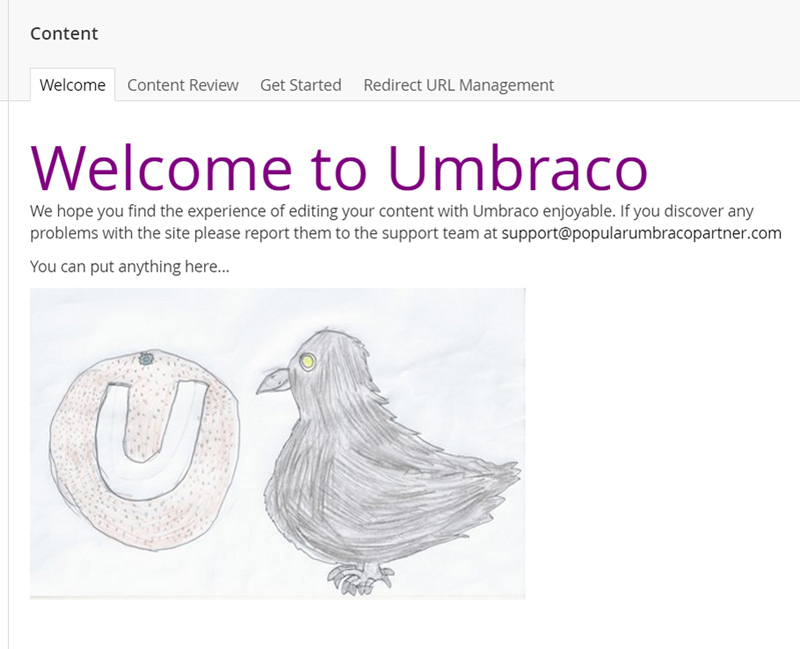 "Add a tab called 'Welcome' to the 'Content' area/section of the Umbraco site, use the WelcomeDashboard.html as the content (view) of the dashboard and don't allow 'translators' to see it!" The order in which the tab will appear in the Umbraco Backoffice depends on its position in the dashboard.config file, so to make our Custom Welcome message the first Tab the editors see in the content section, make sure the above configuration is the 'first' section configuration in the dashboard.config file. You can specify multiple controls to appear on a particular tab, and multiple tabs in a particular section. You can remove existing dashboards, and control who gets to see them by updating the other configuration sections in the Dashboard.config file. This file allows Umbraco to load other resources to use with your HTML view - it is just a file - named by convention 'package.manifest' and will contain the configuration of the resources to load in JSON format. 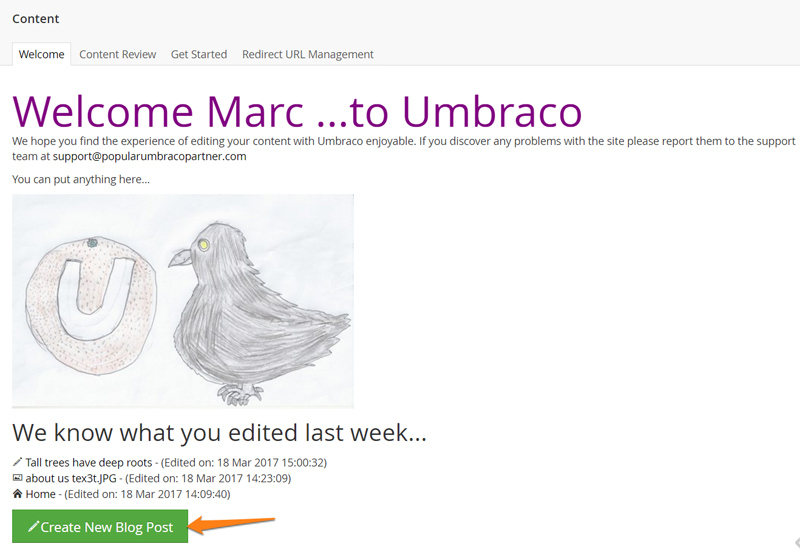 Hopefully, now you can see the potential of what you could provide to an editor as a basic welcome dashboard when they log in to Umbraco. We can add functionality to the dashboard by associating an AngularJS controller with the HTML view. Let's add a new file to the CustomWelcomeDashboard folder called 'customwelcomedashboard.controller.js' where our controller code will live. The use of vm (short for view model) to enable communication between the view and the controller. 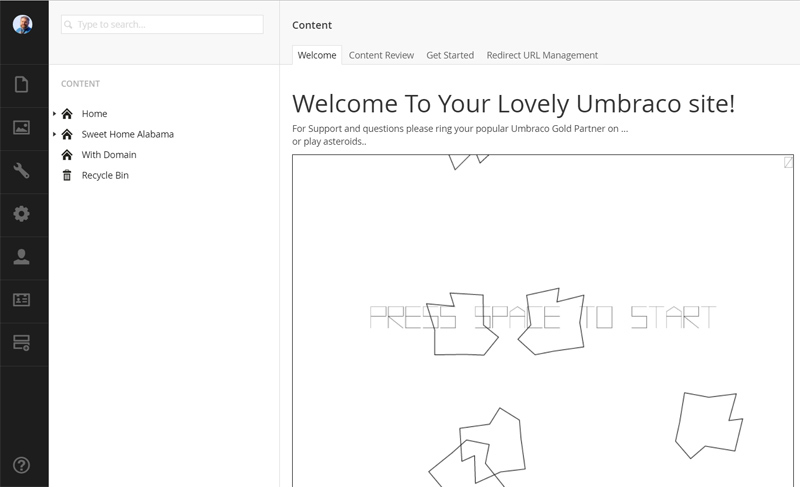 If all is setup fine we should now receive the 'Hello world' alert every time the dashboard is reloaded in the content section of Umbraco, not very helpful, yet. Tip: Notice you can use console.log to write out to the browser console window what is being returned by the promise, it helps to debug, but also understand what properties are available to use. 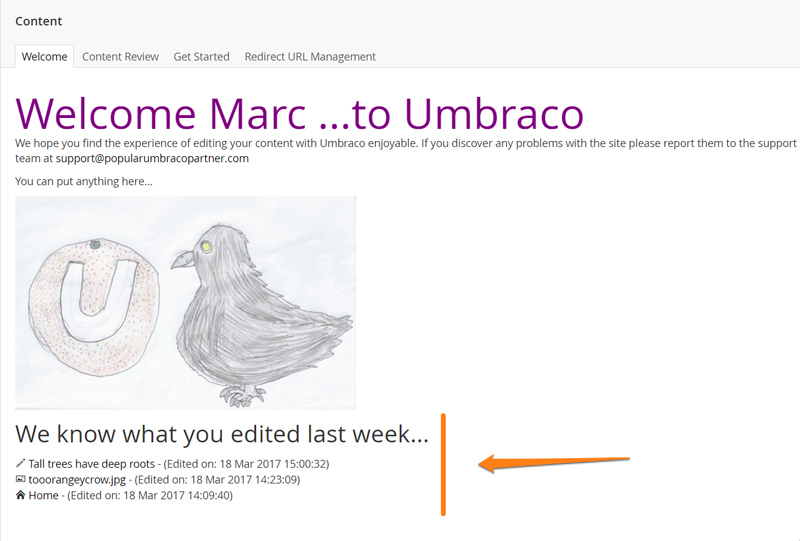 A returning editor may find it useful to see a list of the last few articles they have been editing, with a handy link to load and continue editing (instead of having to remember, and find the item again in the Umbraco Content Tree). 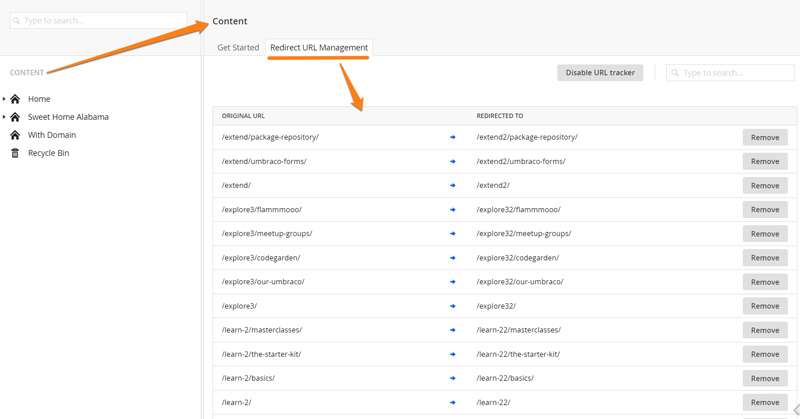 We can make use of Umbraco's Angular resource for retrieving audit log information, the logResource using the getPagedUserLog method to return a list of activities the current user has performed recently. comment: "Save and Publish performed by user"
It's nearly all we need but missing information about the item that was saved and published! We can use the entityResource, another Umbraco Angular resource to enables us to retrieve more information about an entity given its id. We need to loop through the log items from the logResource, and since this includes everything, we need to filter out activities we're not interested in eg, Macro Saves, or DocType Saves, generally we need the entry in the log to have a nodeId, have a 'logType' of 'save' and have an entity type of Media or Content. The entityResource then has a getById method that accepts the Id of the item and the entity 'type' to retrieve useful information about the entity, ie its name and icon. // this is the only way to tell them apart - whether the comment includes the words Content or Media!! 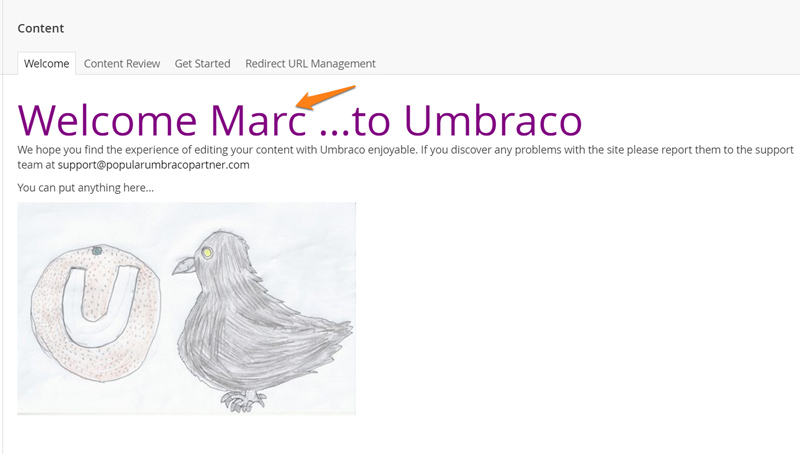 The url /Umbraco/#/content/content/edit/1234 is the path to open up a particular entity (with id 1234) ready for editing. We can use the knowledge that by convention a link to 'edit a page' (as used above) when passed the additional querystring parameters doctype=alias and create=true, can be made to present the user with a brand new content item of the alias type to create within the section. Where 1075, is the id of our blog section, and BlogPost is the alias of the type of document we want to create. You can create your own custom angular services/resources, to interact with your own serverside data (using UmbracoAuthorizedJsonController), The property editor tutorial has a step explaining how to do this part 4 - Adding server-side data to a property editor. What else? What are you waiting for?